Marcel Proust’s madeleine is the cliché cookie—a highbrow reference that’s penetrated pop culture. (Take the Sopranos episode in which Tony’s Proustian madeleine is a slice of cappicola.) The great French author put madeleines on the map, and probably in our mouths, too. We surely have him to thank for those little packages at every Starbucks checkout. Many cookbooks claim that you can reproduce Marcel Proust’s magical madeleine in your own kitchen. But do any of the recipes yield the genuine article? I decided to reverse-engineer Proust’s madeleine, using hints the author gives in Remembrance of Things Past, in an effort to find out. She (Marcel’s mother) sent for one of those squat plump little cakes called “petites madeleines,” which look as though they had been molded in the fluted valve of a scallop shell … I raised to my lips a spoonful of the tea in which I had soaked a morsel of the cake. No sooner had the warm liquid mixed with the crumbs touched my palate than a shudder ran through me and I stopped, intent upon the extraordinary thing that was happening to me. An exquisite pleasure invaded my senses … And suddenly the memory revealed itself. The taste was that of the little piece of madeleine which on Sunday mornings at Combray … when I went to say good morning to her in her bedroom, my aunt Leonie used to give me, dipping it first in her own cup of tea or tisane …. and the whole of Combray and its surroundings, taking shape and solidity, sprang into being, town and garden alike, from my cup of tea. What can we glean from this passage? Proust’s madeleine was quite dry. It demanded not just a quick dunk, but immersion to “soften” it (according to the new translation by Lydia Davis, said to be the most accurate). And, you’ll note, Marcel never bites the cookie. The memory surge is triggered by crumbs. Modern food science gives clear guidelines. To make a cake less moist, you put in less moisture and less fat. That means less butter and fewer eggs. And less sugar, too. Sugar is “hygroscopic”—meaning it helps baked goods retain moisture—so you want to keep it to a minimum. Also high on the list of no-nos: resting the batter. Resting allows the flour to absorb the batter’s liquid and results in a moister product. Running through this list of Proustian baking “tips”—which reads more like a catalogue of baking “don’ts”—the great man’s signature dish was beginning to sound less than appealing: a pathetic, parched product, not a buttery treat. My criteria knocked many supposedly “authentic” recipes out of contention. In The Way To Cook, Julia Child touts hers as “presumably the true Madeleine from Commercy, the one Marcel Proust dipped in his tea.” But she turns out to be an incorrigible batter rester. Not only that, she beats the flour into the egg and sugar mixture, a sure way to develop the flour’s gluten and produce a denser, uncrumby madeleine. Dining With Proust, a cookbook that re-creates dozens of dishes from Remembrance, is co-authored by Anne Borrel, founder of the Proust Museum in Illiers-Combray. But the book’s recipe calls for resting the batter a full hour-and-a-half and, worst of all, includes honey, notorious for its hygroscopic properties. I found two recipes that looked promising. In the Food Lover’s Guide to Paris, French food expert Patricia Wells champions dry madeleines. “The best, freshest madeleine has a dry, almost dusty taste when eaten on its own,” she tells us. Being soaked in tea is what brings it to life. The relatively low butter, sugar, and egg content in Wells’ recipe gave me hope. In The Making of a Cook, Madeleine Kamman traces her recipe’s lineage back to the 18th century and maybe even to “Madeleine Paumier … the young girl who … presented the first known madeleines to King Louis XV of France.” She is adamant that the flour be folded into the batter, not beaten, to avoid the dreaded gluten development. Neither a batter beater, nor a batter rester, she was my strongest candidate. I pulled out my mother’s old early-Julia Child-era imported madeleine molds and set to work. My first batch of the Kamman madeleines came out of the oven smelling great but looking terrible. I picked up one of the misshapen blobs. Not much resemblance to Proust’s “little scallop shell pastry, so richly sensual under its severe, religious fold.” But was it a crumb-producer? A madeleine morsel, it turns out, is a hardy little customer. Protected by a lightly browned layer, it does not disintegrate. Close examination revealed that it doesn’t truly “soften,” but absorbs liquid like a sponge, retaining its structural integrity. The locus of crumb production is confined to the narrow, exposed lens-shaped surface at the break-off line (see fig. 2). Would another recipe yield more Proustian results? Patricia Wells’ fared no better. (Except, perhaps, in terms of taste. Her madeleines, supposedly “dry, dusty” tea-soaker-uppers, were delicious on their own. Half the batch disappeared while the tea was brewing.) Wells’ madeleines produced no more crumbs than Kamman’s. Julia Child’s, as I expected, were equally crumb-free. Things were looking bad for M. Proust. The sickly author, who hardly left his cork-lined bedroom in Paris for a dozen years, from 1910 until his death in 1922, supposedly channeled an entire world in all its precise sensations, setting it down on paper for us to re-experience. But my mind was afflicted with a blasphemous thought: Could Proust’s madeleine ever have existed? Could it be he … made it all up? I had one theory in reserve. Maybe Proust’s Madeleine was stale. Unthinkable? Not necessarily. Proust was not finicky about his sensory stimuli—the fictional Marcel is even propelled into a reverie at one point by the dank smell of a lavatory. I left my remaining madeleines outside, uncovered, defying instructions to keep them “stored in a tightly closed tin.” After three days I brewed a glass of tea. I broke off a piece of madeleine and plopped it in. The result: about the same as before. I stirred, took a spoonful. A few brown bits swam in the spoon. I tasted. And here came the shocker: I could not taste the crumbs. Madeleine crumbs, once detached from the mother morsel, are quite delicate. They almost dissolve. It turns out they are insensible to the tongue. I called my wife into the kitchen (her initial comment: “Does Proust explain who cleaned up?”) for an objective opinion. She has a fine palate, but couldn’t taste the crumbs either. Confounded, I decided to confer with leading Proust authorities. I discovered a major obstacle: the eminent professor William Carter, author of Marcel Proust: A Life, who had supervised a re-creation of the famous scene for a PBS documentary. The professor was skeptical. He was turned off by my notion that Marcel had “dissolved pieces of madeleine floating around in his teacup,” calling it “not likely.” And, to my surprise, he asserted that Marcel does dunk and bite the madeleine—which would mean there’s no crumb production mystery to be explained. The professor insisted that the crumbs are simply created in the narrator’s mouth after he bites off a morsel and shmooshes it around. I objected that no biting, or shmooshing, is mentioned in the text. The professor insisted it is “implied.” But, in my view, Proust was simply too obsessed with detail to let something as significant as biting, let alone shmooshing, go unnoted if that’s what he had in mind. Much to my relief, I found firm support from MacArthur “genius” grant-winner Lydia Davis, the translator of the widely praised new edition of Proust’s Swann’s Way, in which the famed passage appears. She finds no “implied” biting in the text, and calls mere dunking “out of the question.” She concurs that the crumby madeleine material is already in the spoon as it approaches Marcel’s mouth. The tie-breaker was Stanford professor Joshua Landy, a Proust scholar who declares himself firmly in my “crumbs in the spoon” camp. I’d given Proust a more-than-fair shot. His failure to account for extraordinary crumb production was manifest. Case closed, then: Proust’s madeleine did not, does not, and never could have existed. To put it bluntly: Proust didn’t know from madeleines. This may be less than surprising. As it turns out, Proust’s original model may have been a piece of soggy toast. 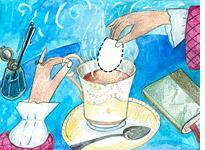 In an early version of the scene, the narrator is offered a piece of “dry toast” which he dips in his tea. The “bit of sopped toast” triggers the familiar surge of memory. This fact is not advertised to tourists making the pilgrimage to Illiers-Combray, where madeleines are sold by the bushel, and one patisserie does good business claiming Proust’s family as patrons. But Proust must have understood the madeleine’s power. Otherwise he would have just left us the soggy toast. A well-made madeleine (and, please, rest the batter) is that rare thing: perfection itself. The shape, so pleasing to the eye, the double surface texture (ridged on one side, smooth on the other)—and, yes, the buttery, lemony taste. Make a batch. Take a bite. An “exquisite pleasure” will invade your senses. And you will have your own madeleine memories.